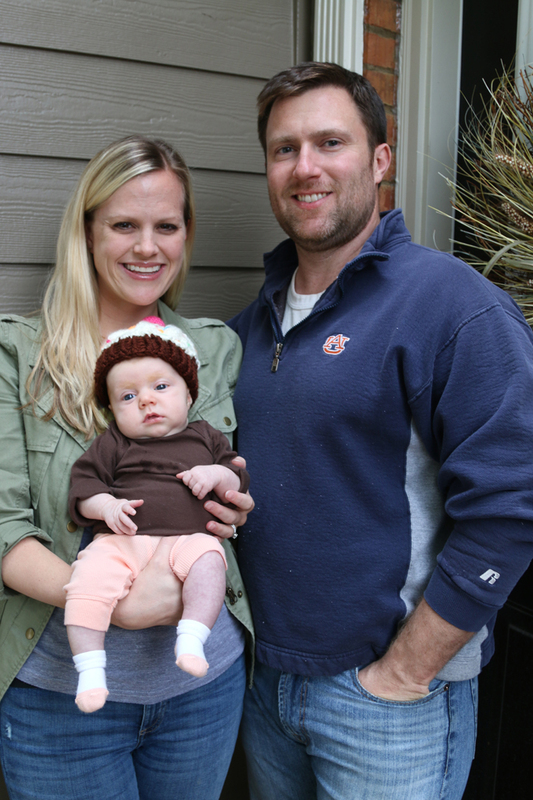 Milestones: Just after turning 4 months, Leighton mastered the roll from back to stomach. It caused a lot of nighttime wake-ups once she rolled onto her tummy (which made for some very tired parents), but she pretty quickly learned to fall back to sleep on her own. A couple weeks later, she figured out how to roll from her tummy to her back (but doesn’t like to do it as often), so she’s a little rolling machine now! Likes: She loves standing up (with a bit of help) and anything she can hold and put in her mouth to “chew” on, including burp cloths, rattles, toys, her clothes, and the hands of whoever is holding her. She also sits up in her Bumbo chair and plays with toys while we’re cooking in the kitchen or eating at the table (and by “plays with toys,” I mean “throws them on the floor for us to pick up every 30 seconds”). Dislikes: She flips herself over onto her tummy and likes the new vantage point now, but she’ll get upset if left in that position for too long. She’s also regressed with naps a bit and won’t go down in her crib very easily during the day (even though she sleeps really well in there at night). We’re working on it and hoping this phase passes quickly. 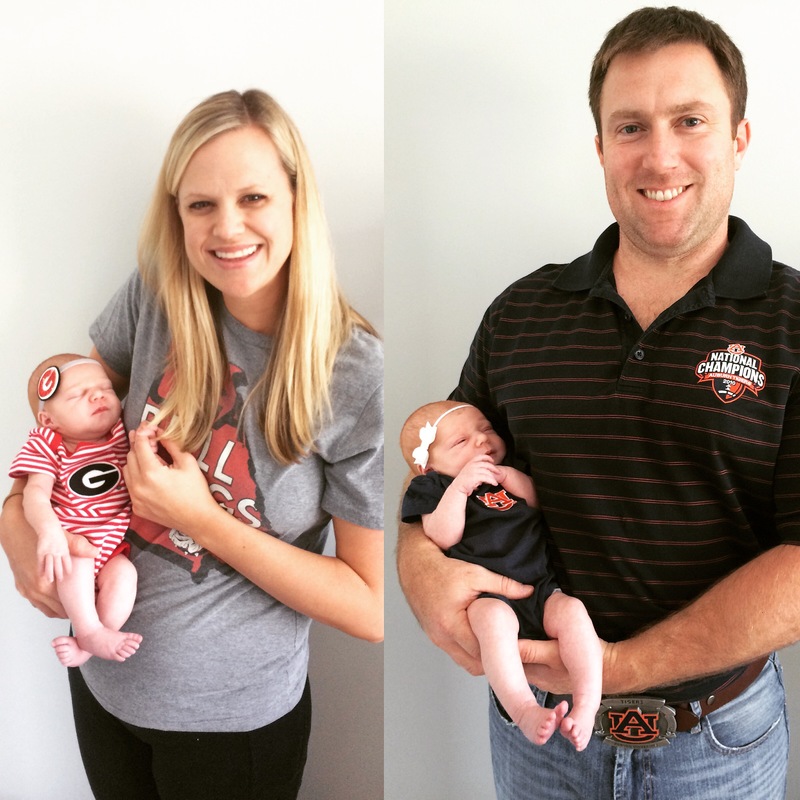 Fun stuff & firsts: We started feeding Leighton rice cereal in mid-January, and it went better than expected! She tries to grab the spoon so she can chew on it, and she makes the cutest chewing motions when the food goes in her mouth. After about 5 days, we moved on to oatmeal. At the end of the month, we tried her first real food, puréed sweet potatoes, and she gobbled them up! My parents were there to watch, which was fun – and quite entertaining when she decided that a paper towel was the best food of all. 🙂 Since then, she’s had butternut squash, pears, and apples, all of which were well received. She graduated to sitting front-facing in the BabyBjorn, which she seems to enjoy a lot more than when she was facing inward. She has found her toes and also taken an interest in Coco recently and will reach out to touch her fur and nose when Coco comes over to sniff her. I can only hope that they become best buds one day! She had her first fever at the end of January, which got up to 102.6 degrees. Yikes! Thankfully, she was a trooper and acted fine other than some congestion. With rest and some infant Tylenol, she was on the mend in just a couple days. This month has by far been the most fun and enjoyable for all of us. It’s so neat watching her learn and change so much, sometimes doing new things each day. She’s super smiley, and I just can’t get enough of that gummy grin. Every day with her is better than the one before! We had her four month checkup this morning, and she’s healthy as a horse (or little pony?). She of course hated her shots, but she was a trooper, and I promised her a cookie. 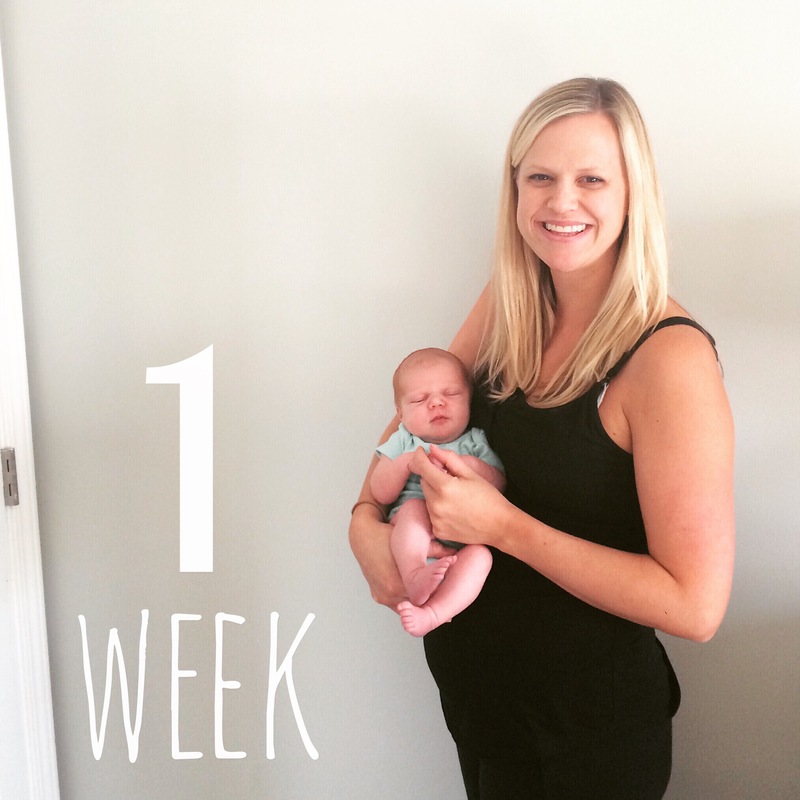 Milestones: Just before 14 weeks, we noticed that she was continually breaking out of her swaddle at night, and she was waking up every time. 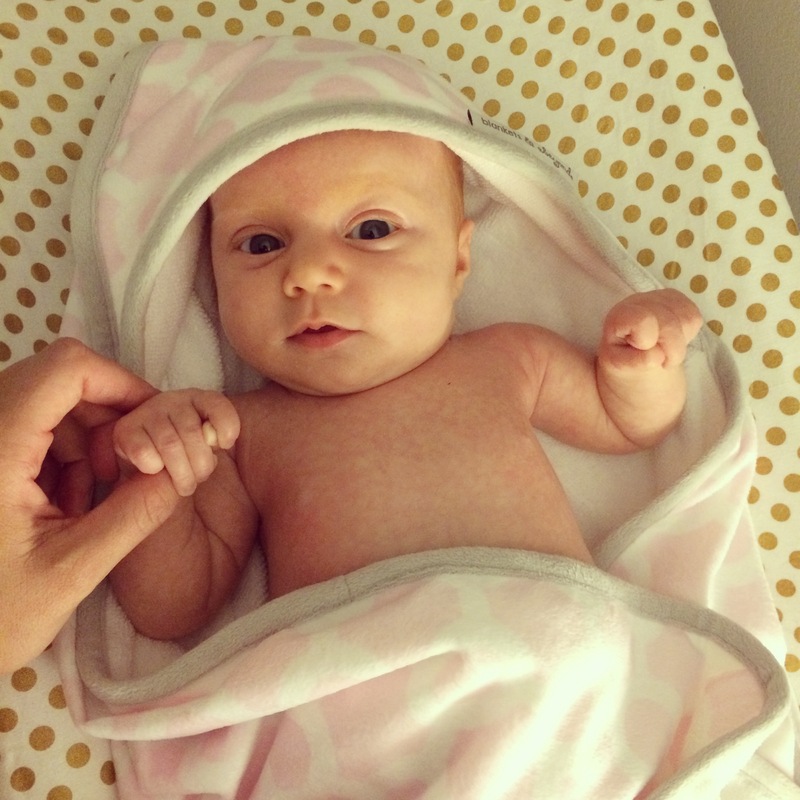 We decided to start transitioning her out of the swaddle, and Night 1 was horrible! We left one arm out of her normal blanket swaddle, and she was up every few hours, still breaking out. On Night 2, we changed to the Halo Sleepsack, which had been recommended by a few friends. What a Godsend — she slept from 8:30pm – 3:30am and then after eating, she went back to sleep until 8am!! The next night was even better, with her sleeping the first stretch till 4:45. Hallelujah for the Halo Sleepsack! (I will say that the next week, she didn’t sleep quite as well, but we also started a round of out-of-town trips lasting 3 weekends in a row, so I’m sure the stress of traveling didn’t help anything.) Now that the holidays are over, we’re getting back on track, and she has both arms out of the swaddle. On Friday, she slept for a solid 10 hours from 8pm to 6am (her longest stretch ever) — hallelujah! A few weeks ago, she really took to sucking on her fingers… usually 3-4 of them at a time! Ha! It’s so loud and funny, but we’re glad she’s found something to soothe herself since she’s not a big pacifier fan. Just recently, she has started to get the hang of sucking her actual thumb, too, and it’s kind of adorable. And for the final milestone of the month, she has rolled over! I came into her room to get her up on Saturday morning, and she was crying a lot more than usual. What do I see when I look in her crib, but a baby who is on her stomach and NOT happy about it! I’m sure this will make for some sleepless nights as she gets the hang of this skill, but it’s exciting to see her learning new things. Likes: She loves her fingers! Also, anyone holding her is subject to their fingers going in her mouth and being slobbered all over. Pretty much everything she can get her hands on is going in her mouth right now. She’s really started to focus on things and is now able to grasp small toys and rattles, which she’ll play with and look at to entertain herself. Leighton also loves looking in the mirror – you’re almost always guaranteed a big smile when you hold her up in front of one. This past weekend, we picked up a Baby Einstein exersaucer to try out since she’s been doing so holding her head up. After assembling 47,000 parts, she got to take it for a spin, and she loved it! Dislikes: She’s not the biggest fan of having clothes pulled on over her head, but if I can distract her enough, she’ll let it fly. Waiting to eat is still her #1 pet peeve, but being left in the swing or on the activity mat for even a minute too long will elicit a pretty solid cry as well (and that’s usually during our dinner). 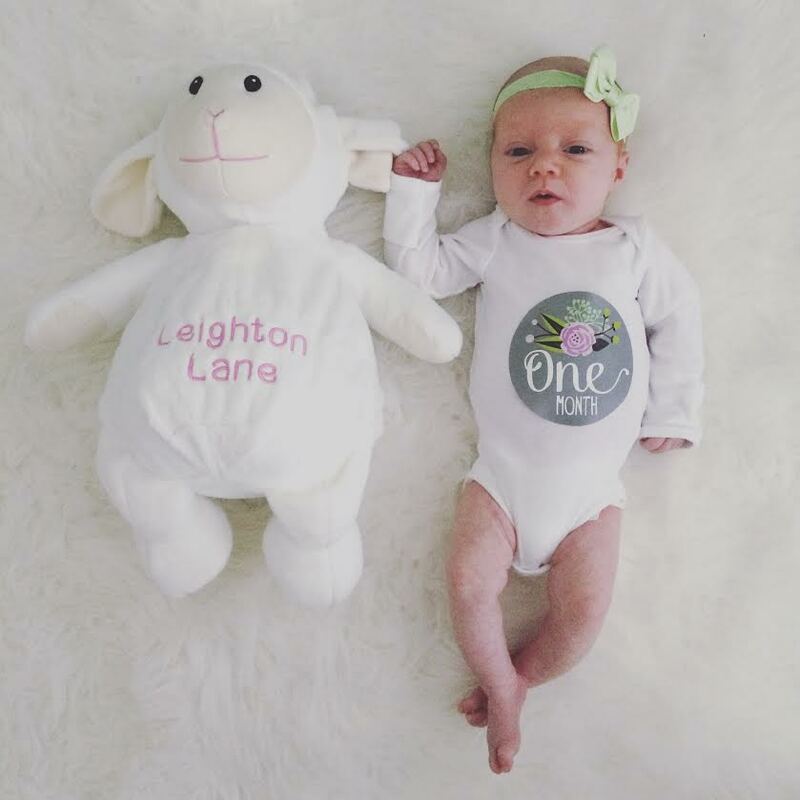 Fun stuff & firsts: Leighton had a big month celebrating her first Christmas season! 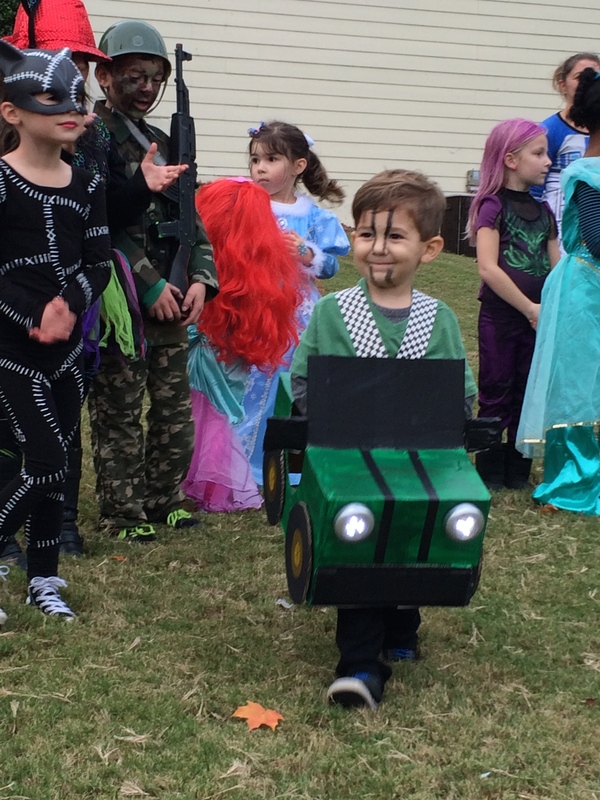 Even though she wasn’t really aware of all the fun and festive outings, gatherings, and activities, it certainly became a much more magical time of year for us. She’s been dressed in red jammies and Christmas shirts all month, got to meet Santa, has gone to look at Christmas lights, and has been asking for a pony non-stop, which she of course received (don’t worry – just a stuffed one). 🙂 It’s amazing how much more magical holidays become when you get to share them with your child! She marked off her 4th state on the map this month — we went down to South Alabama for my dad’s extended family’s annual Christmas get-together. She has gotten over the phase of not wanting anyone but mommy to hold her (it lasted almost a month) – and we couldn’t be more happy! 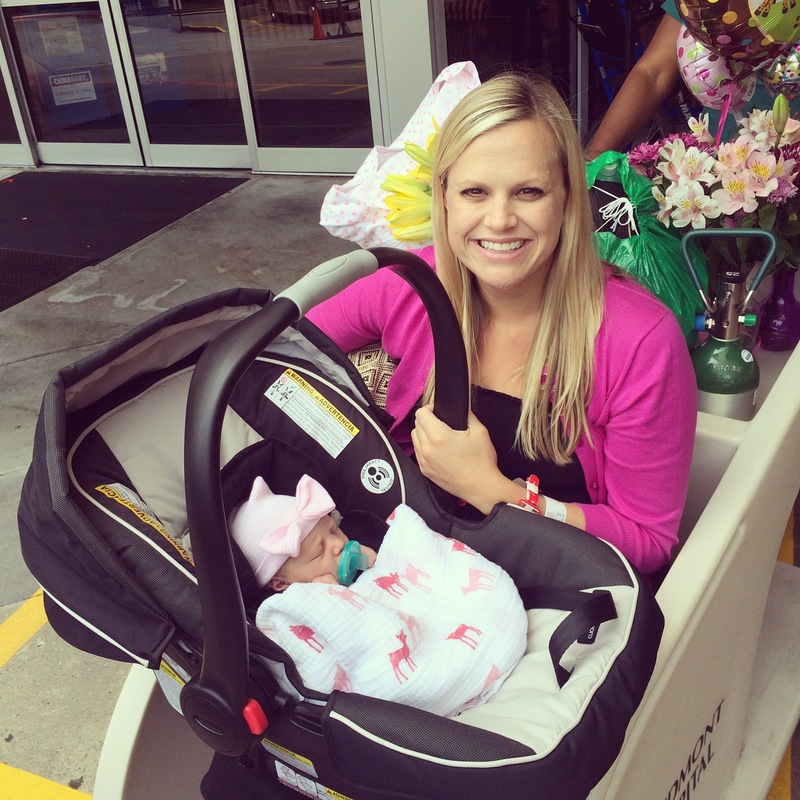 She let so many family members and new people hold her at the various Christmas week gatherings, which was a miracle. I know more of these phases will come and go over the next few years, but we’re pretty excited this one seems to have passed for now. Her hair is falling out on the back of her head, but she has a lot of peach fuzz on top. Her eyes are bright blue, and I hope they stay that way! They’re so big and pretty, and she’s always wide-eyed, taking in everything around her. We joke that she has “pillow feet” because they’re puffy, and we can’t get enough of her little arm and leg rolls. Chubby babies are the best!! She is obsessed with her tongue! She sticks it out all the time and looks like a little lizard — it’s the cutest thing ever. Likes: She has become so incredibly smiley, especially when she’s lying on her back in our laps or on her changing table! And for some reason, getting to lie there in just her diaper is like icing on the cake to her! Of all the baby-holding devices that we use to help us around the house from time to time, she seems to really enjoy the 4moms Bounceroo the most. I put her in it in our bathroom every morning and we listen to music while I get ready for the day. She’ll stay in that seat and be happy about it much longer than when in the swing downstairs. She probably just likes staring at the bathroom lights, but I’ll take it! She’s also really started to enjoy her activity mat. She’ll happily lie there staring up at her monkey and puppy friends hanging above her head. It’s fun to see her focusing on objects, occasionally reaching out for them, and enjoying “play” time more and more! She has started to get rather attached to me, which of course makes me feel like a million bucks, but it is also hard because I’d love to hand her off to everyone who wants to get in some baby snuggles. Hopefully this phase will pass before too long so that friends and family can enjoy holding her as much as I do! Fun stuff & firsts: She had a very exciting first this month — our friend Amy’s son Jack, who is 2, managed to sneak in a kiss when we came to visit over Thanksgiving, and it was pretty darn sweet. 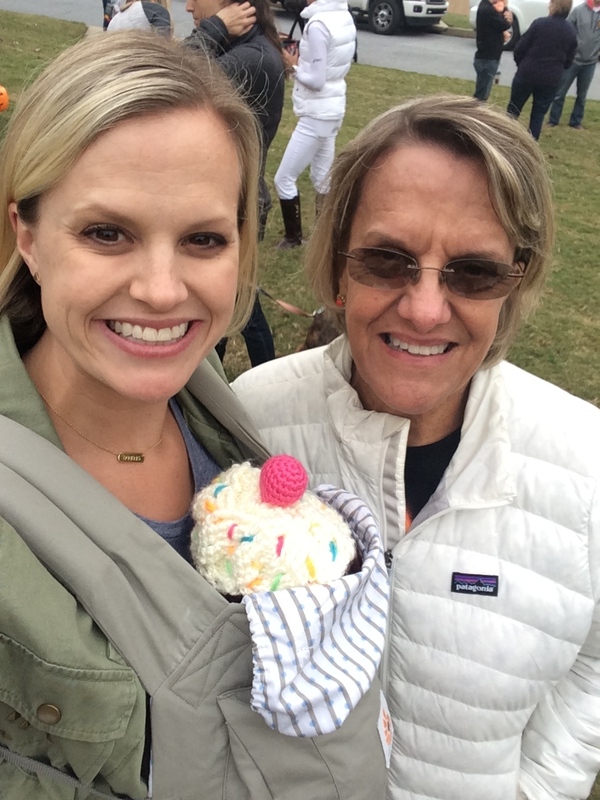 We celebrated Leighton’s first Thanksgiving and took a road trip to Nashville to be with Craig’s family. This was her first time going to Tennessee, and we had so much fun introducing her to all of his extended family, as well as several of our friends. She’s now checked off 3 states in just 2.5 months — next up, Alabama for our Sims/Smith/Finch family Christmas! 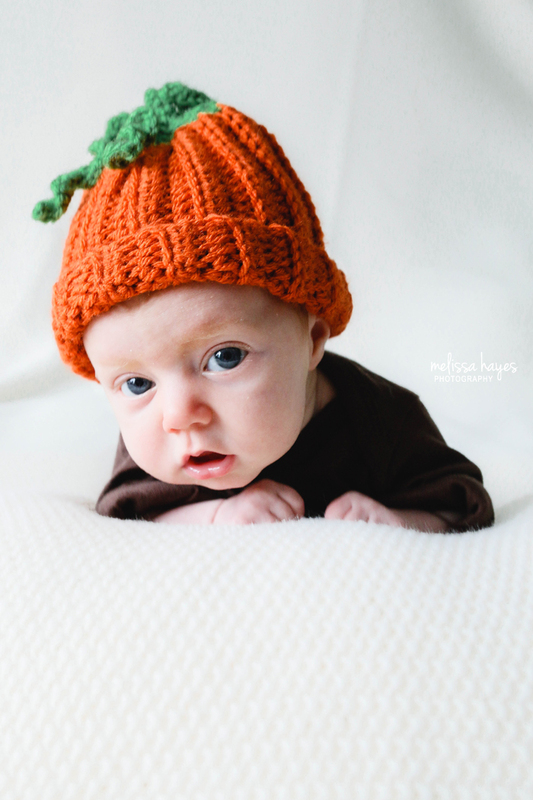 We had her two month checkup this morning, and aside from a little cold and slight cradle cap on her eyebrow area (that’s why they look orange in photos right now), she got a glowing review from the doctor. She did have to get her first round of shots, which is never fun. Thankfully, we don’t have to go back till she’s 4 months. Yay! Milestones: Leighton moved on up to size 1 diapers this month, and she has also outgrown most of her newborn clothes. We have a couple pair of footie pjs that she never even got to wear because she was too long for them. She’s growing like crazy, which is great but also bittersweet! She has also become so much more alert. All of a sudden, she really likes to be held facing outward and sitting up – I guess she was tired of just looking at us all the time. 🙂 And she’s been rocking tummy time since we started propping her up on a little boppy pillow. The first time she held her head up high and looked all around was one of the sweetest things I’ve ever seen! She also loves going on walks in her stroller. We got the City Mini GT, and I love it so much! A couple weeks ago, we started laying down the back of the seat so she could be strapped right into the stroller rather than having to sit in her car seat since she’s still so small. She will lie there looking up through the little sunroof in the hood of the stroller, just happy as a clam! Dislikes: Still seriously hates being made to wait more than about 5 seconds to eat when she’s hungry! It’s amazing how mad she can get and how quickly things escalate when she’s dying of starvation. She also does not appreciate being swaddled — especially by her daddy because he does it so tightly! But it never fails to calm her down and get her to sleep once she’s wrapped. 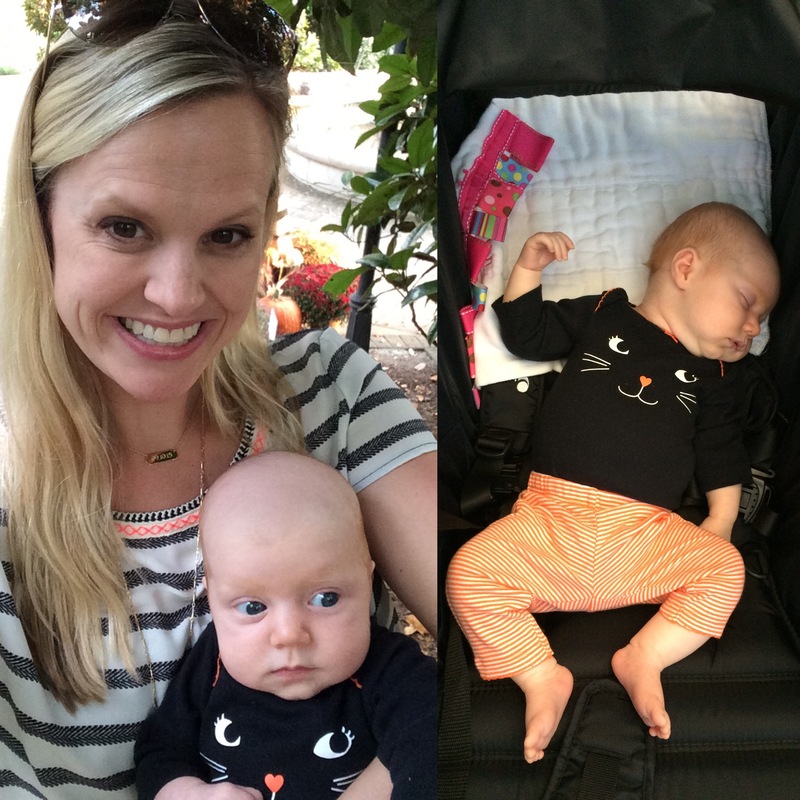 Fun stuff & firsts: We celebrated Leighton’s first official holiday — Halloween! 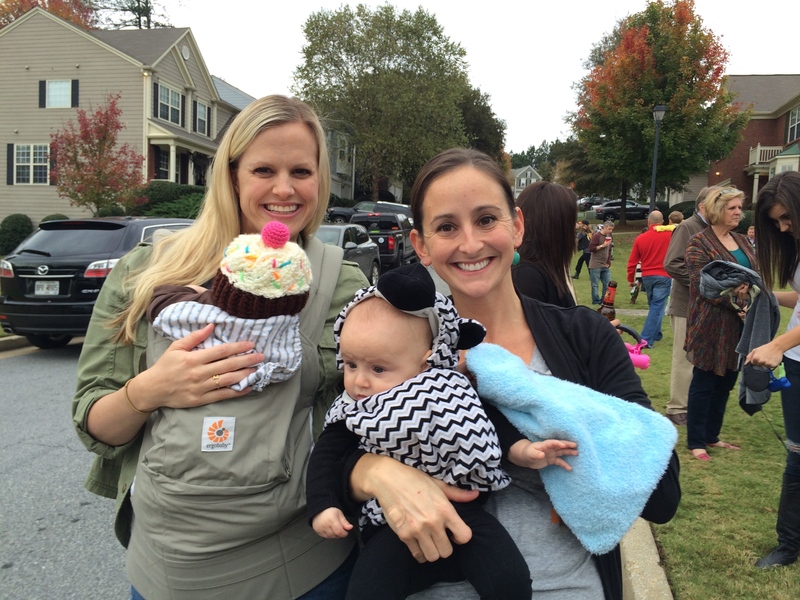 She was the cutest cupcake, and we had a great time celebrating with our neighborhood friends. Not exactly fun, but she seems to have developed a bit of acid reflux recently. Out of nowhere, she started screaming every time she was put in her crib at night, her spit up went from normal to crazy amounts being spewed all over us and the floor, and she seemed to be in a bit pain during feedings. So we’ve done a few things to help, and they seem to be working. Hopefully she’ll outgrow this before too long! The past month, she’s had several restaurant and shopping outings, and she’s getting much more used to hanging out in her car seat for longer periods of time. Riding in the car tends to put her to sleep pretty quickly, which is nice! To cap off her 2nd month, Leighton has found her tongue, is chewing on her fists, and has officially started smiling! To interact with her and receive a genuine smile is one of the happiest feelings — it totally redeems her random crying fits. 🙂 But seriously, baby smiles will melt your heart! 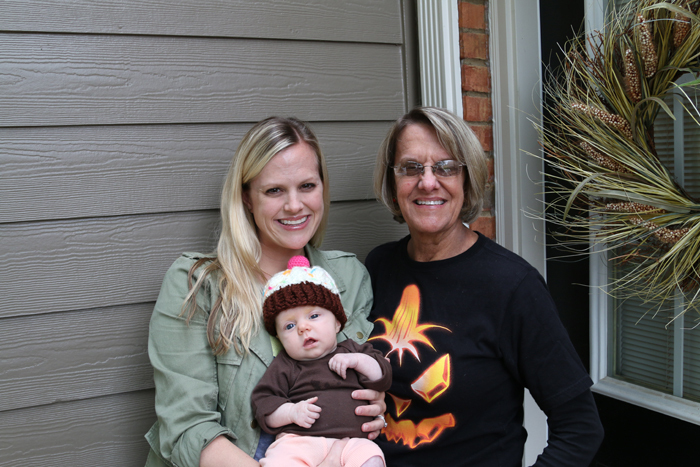 Halloween marked Leighton’s first official holiday, and what a fun one to start out with! We dressed her up as a cupcake because I joked throughout my pregnancy that she might come out as a cupcake or donut due to the amount of desserts I ate. 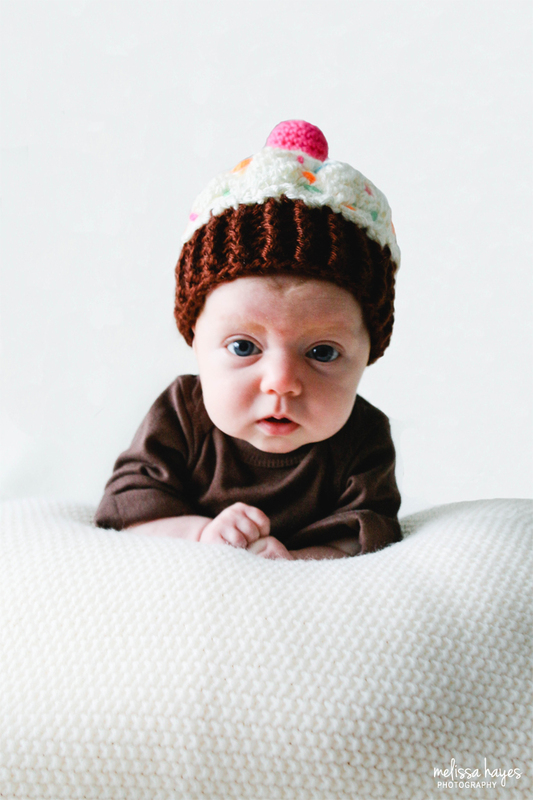 🙂 I found the cutest knit cupcake hat on Etsy and finished off the simple costume with a brown onesie to look like the “cake” portion of the cupcake. 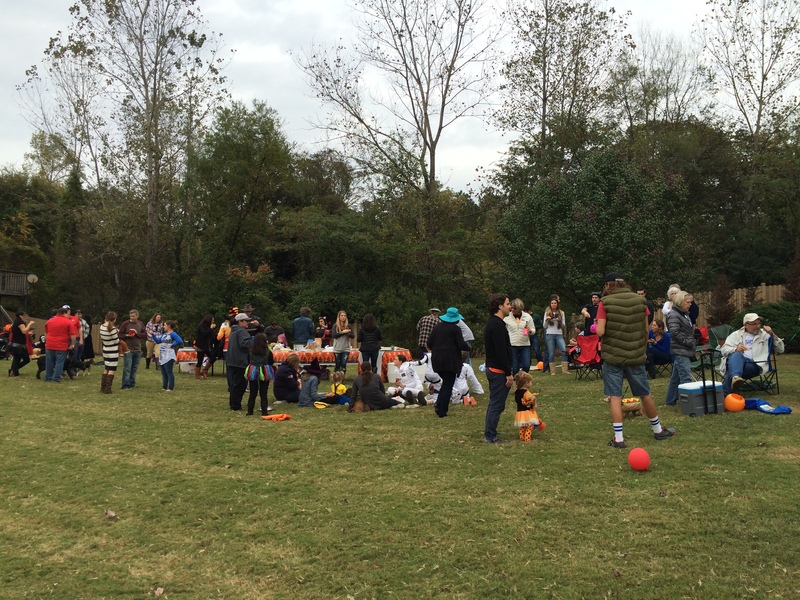 Our neighborhood gets really into Halloween and has a big potluck outside in our green space, followed by a parade of kids in costumes and trick-or-treating. Even before we had Leighton, we’ve always loved this neighborhood tradition. 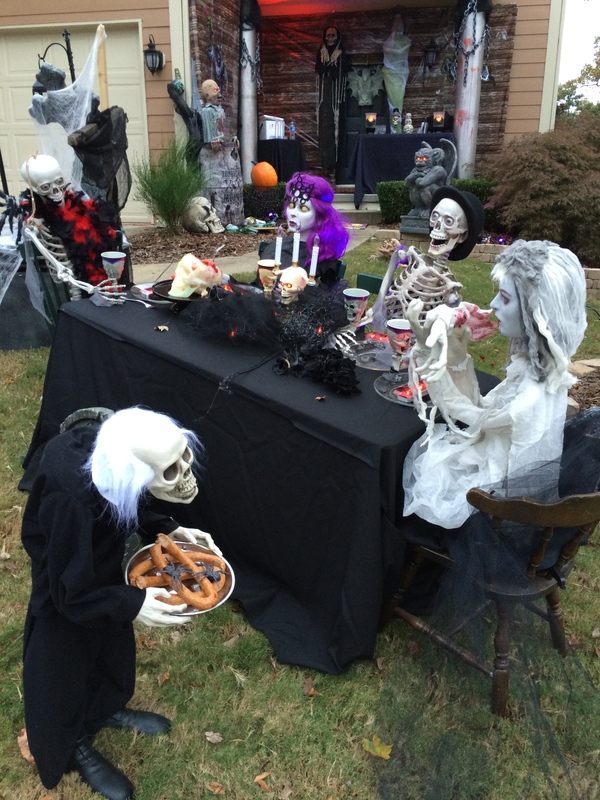 We’d set up shop in the driveway and hang out with the neighbors well after the last trick-or-treaters had passed through. This year, my mom got to join us for the fun and also helped watch L so we could enjoy the night with everyone. Craig set up our fire pit and Adirondack chairs on the driveway, as well as our new Coolest cooler speaker (that also holds drinks this time) and a wagon filled with candy. 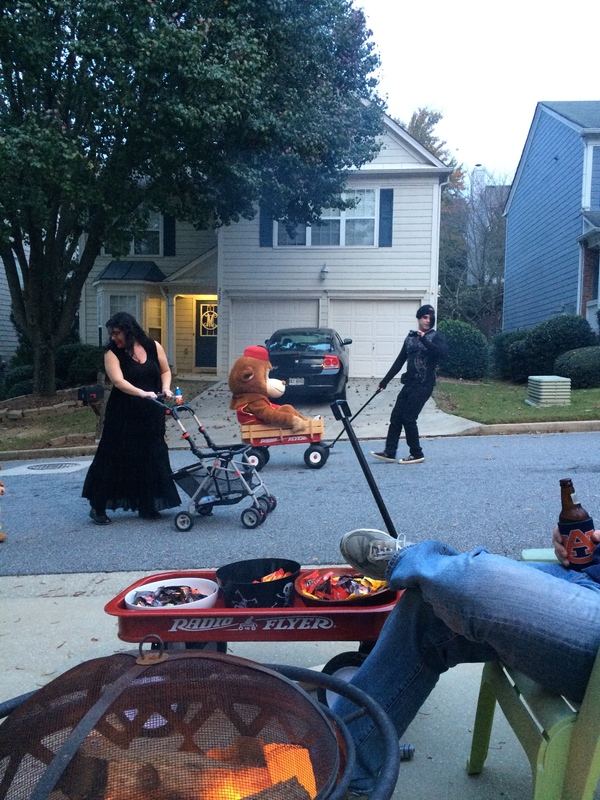 The fire drew in all sorts of visitors until way past the last round of trick-or-treaters! 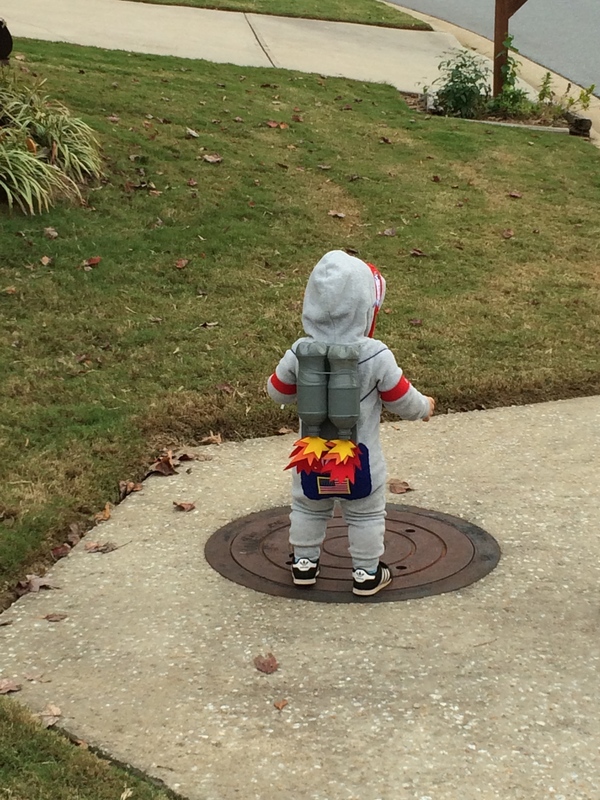 Some of my favorites from the neighborhood costume contest were the tiny astronaut, the little green race car (complete with working headlights),the Orange Cabbage Patch Doll, and the family of vampires and a miniature bat. Little cupcake managed to sleep snuggled up next to me in her carrier for the majority of the festivities, but she promised that she’d be up for more fun next year when she’s 1. Leighton turned one month old last weekend, and we also took our first out-of-state trip with her to celebrate my grandmother Nana’s 90th birthday. What a fun trip! This past month has brought us little sleep and little contact with the outside world (other than wonderful visits from family and friends who came to deliver food). But I think it’s safe to say it’s also been the best, most joyful month of our lives. We’ve started to settle into a routine and are learning her many needs and how to care for our little girl. Being a new parent is not for the faint of heart, but it’s the most rewarding, fulfilling job and privilege. 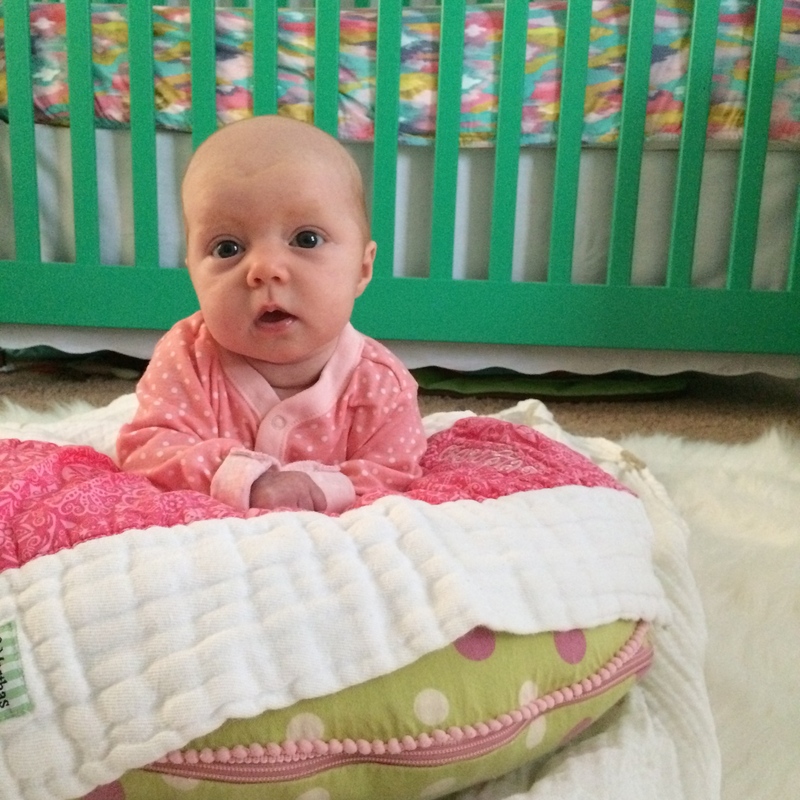 We had her one month checkup this morning, and she has grown a ton in just 3 weeks – almost 2 inches in height alone! The doctor was really happy with her stats, and we’re thankful for a healthy girl (with a very healthy appetite). Likes: She LOVES being held, and we discovered (during one of her many screaming fits) that she will usually calm down when we bounce around with her while listening to (and singing) songs played on Pandora. 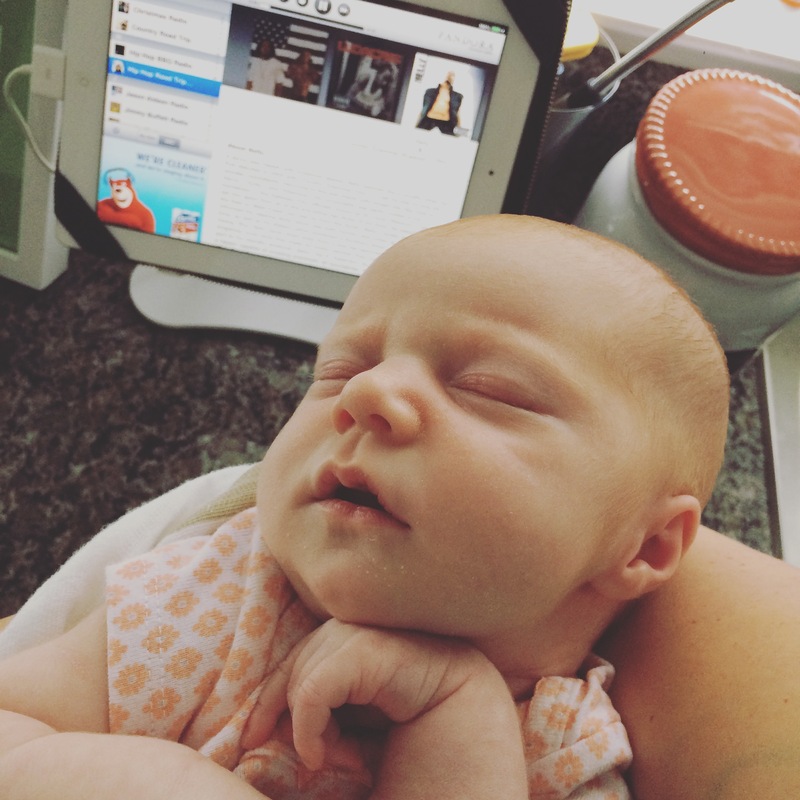 So far, she’s a big fan of country and hip hop. Such a perfect combo of her mom and dad – ha! She loves to eat, and she is obsessed with having her tiny hands by her face. She’s also taken to napping in the Solly Baby Wrap, which is a lifesaver for me when I’m home alone and need to get things done around the house. Fun stuff & firsts: We’ve had a fun month filled with the start of football season, her newborn portrait session with my childhood best friend, our trip to Jacksonville for her first party, and the beginning of fall. 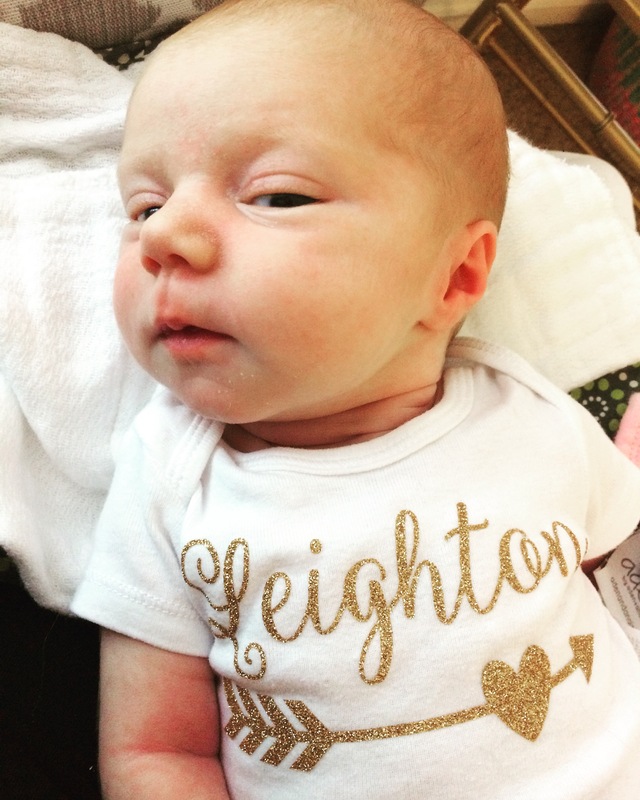 Leighton got to meet all three of her great-grandmothers in her first month, which has got to be some sort of record, especially given that they all live out of state. I really wanted them to meet her soon after she was born, and I’m so thankful that it worked out for that to happen! So far, she’s gotten several nicknames: LL Cool Hayes, Lay Lay, Tooty Booty (I’m sure she’ll appreciate that when she’s older), LL, and Baby Bear (her puppy sister Coco is nicknamed Coco Bear). We have had the best time laughing at her array of funny faces and noises. When she was born, her little cries sounded like a baby goat, and she makes the most hilarious oinking sound when she’s really hungry and starts to eat. It never fails to make us laugh. She also makes the sweetest little coos and sighs while she’s sleeping, and she loves putting her balled-up fist right next to her head. My favorite face that she makes is one that I call “baby bird,” which she does when she’s hungry (before getting downright angry). She purses her lips together and looks all around with the biggest, sweetest eyes. It’s the absolute cutest thing! The first month of Leighton’s life has absolutely flown by. I couldn’t be more thankful for our healthy, thriving, happy little girl, and I’m excited to see what changes the next month brings! Welcome to the world, Leighton! 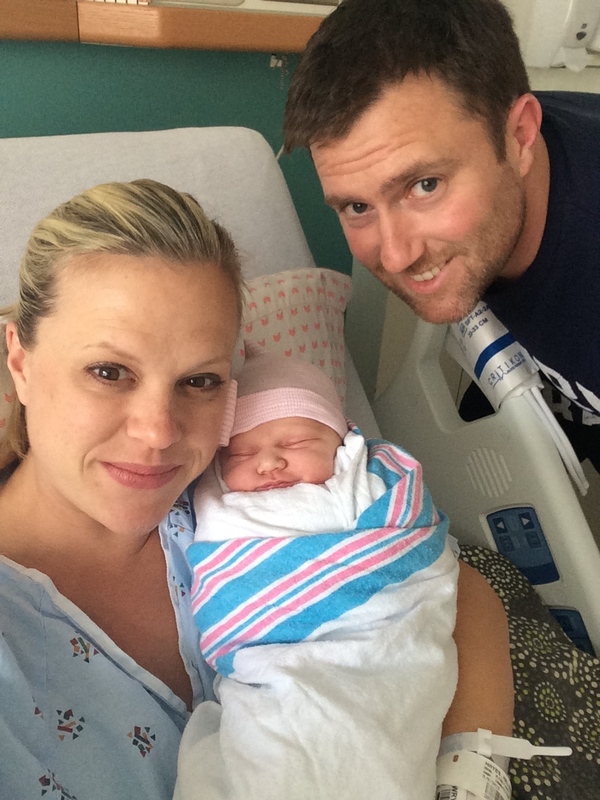 Craig and I could not be more thrilled to announce the arrival of our precious baby girl, Leighton Lane Hayes! 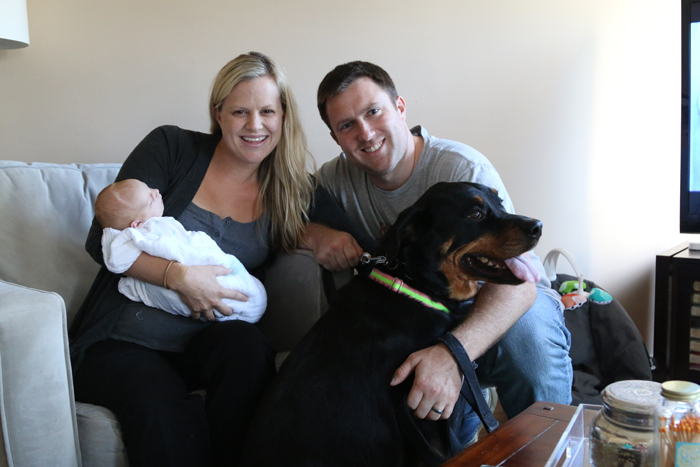 She arrived just under 5 hours past her due date at 4:53am on Thursday, September 10, 2015. 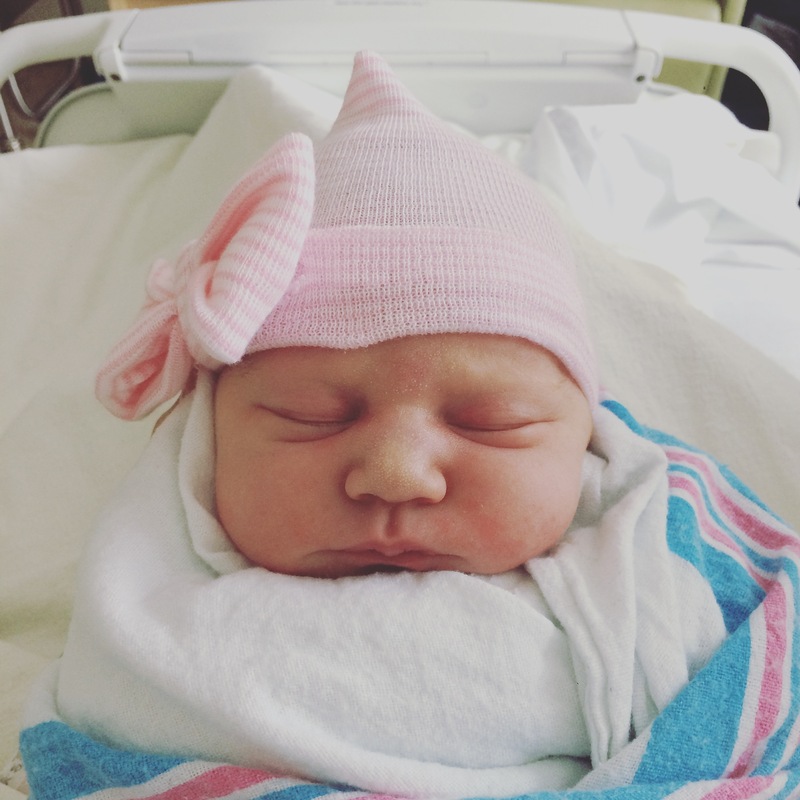 She weighed 7 lbs 6.9 oz and measured 19 3/4″ long and has Auburn colored hair, which we were a bit surprised by! I started having contractions on Wednesday, 9/9 (our due date), and after a couple calls with the on-call doctor, we headed to the hospital that night and were admitted at 10:30pm. Things progressed much more quickly than I thought would have been the case with our first baby, and by 2am, I was more than in need of an epidural for the pain. That process was much less excruciating that I had anticipated, but that also may have been because I knew it would bring some relief from the pain I was in every couple minutes with contractions. Oh man, labor pains are like nothing I’ve ever felt before! I told Craig and my mom that whoever invented the epidural is now one of my favorite people — I don’t know how I would have made it through delivery without it. After just 1 hour and 23 minutes of pushing, Dr. Taylor delivered our healthy little girl and I’d say it was the single most amazing, surreal moment of both of our lives. It’s amazing how naturally little Miss Leighton has become a part of our family. In some ways, I feel like we’ve had her forever, because I can’t imagine our lives without her now. Coco has been adjusting well and enjoys sniffing and licking everything Leighton touches. I see a good bit of Craig in her coloring and features, and I can’t wait to see if her hair stays that pretty Auburn color or if her eyes turn brown like mine did. We’re getting the hang of life with our new addition, and while we’ve never been so exhausted in our lives, we also feel so incredibly thankful and honored to have been chosen to be this little one’s parents. She truly is God’s perfect gift to us!